If it isn’t obvious by now, I am intrigued with Scottish History, but I hope to use that interest as a springboard for more expansive thoughts. History is about particulars, but equally it is about the expansion of the general from the particular. A case in point is an object in the collection of the National Museum of Scotland. While searching for information on the early Jacobite rebellions I came across an archer’s coat. 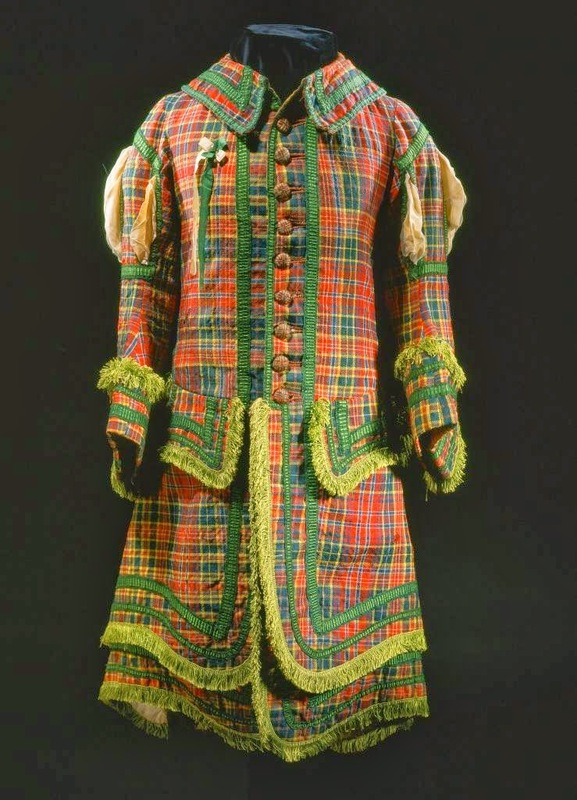 It is a tartan coat of the Royal Company of Archers and according to the museum archives if is from circa 1750. At first glance that would be as wrong as anything I know. The style of the coat is at least 75 years older than that, and in fact I have seen this same coat on the Internet dated as being from 1715, which still seems only slightly less jarring. So what is it, 1715 or 1750 and how long were the archers and their tailors living in the hills? The search was on for information about this coat, which led to the family portrait illustrated here. The painting appeared in several online articles, but I couldn’t find an attribution. 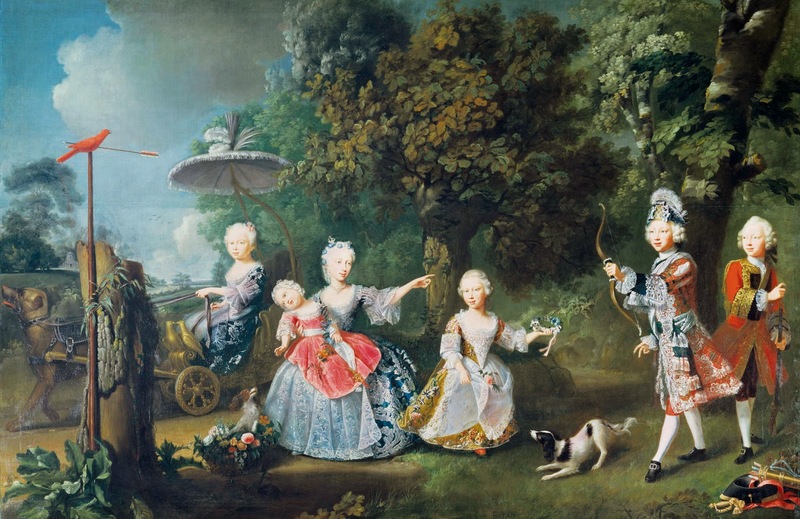 Finally one posting attributed it to Du Pan, who it developed was Barthélemy Du Pan and the subjects were the children of Frederick, Prince of Wales. 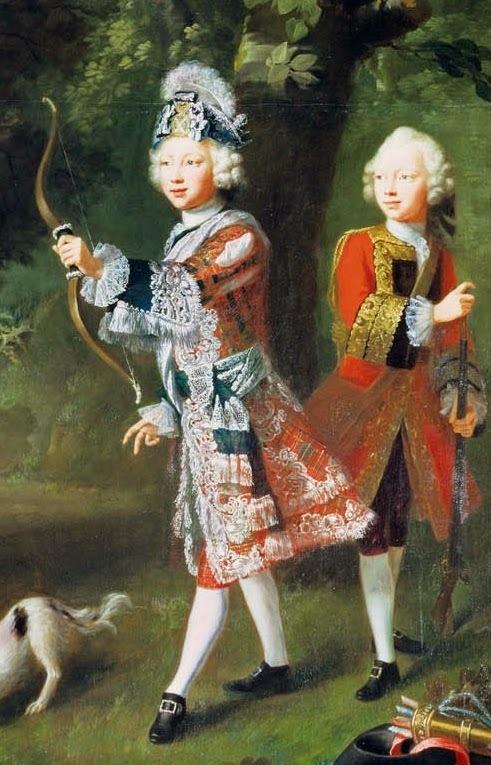 The figure in the tartan archery uniform is the future George III. His outfit is that of the Royal Company of Archers, who are the ceremonial bodyguards of the sovereign in Scotland. Formed as a society of archers in the 1670s they obtained a charter from Queen Anne in 1704 and letters patent as a royal company in 1713. The uniform of the company was created at or about this time and is a “plainer” version of the uniform worn by the young George. This uniform was the standard though his time and then lapsed until 1789 when a more contemporary version was created. Preparing for the visit of George IV in 1822, a uniform was created using black watch tartan for the trews and short jacket. This is a synopsis of information that comes from an article concerning the Archers on the web by Peter Eslea MacDonald and is well worth a full read. The author goes into detail about the tartan and the history of the company. He says it much better than I. What intrigues me is that without the supporting evidence of the Archer’s use of historical costume, as a uniform, the dating would look wrong. The fact that the uniform was unchanged for decades and was stylistically dated when conceived around 1713 creates an anachronism that can confuse the modern eye. MacDonald creates a visual timeline that places this particular anachronism within a forty-year span. How often does this happen without our awareness? Were items of clothing created for a specific purpose that were recognized at the time as being anachronistic? In an age that saw itself as public theatre are we at a risk of dating too specifically or rather too knowingly. I’m not looking to overturn the cart, rather are there groups or events which create their own timeframe outside of the normal flow for a specific reason, that goes as of yet undocumented? the promise of reconciliation? This is why I often prefer history to fiction. 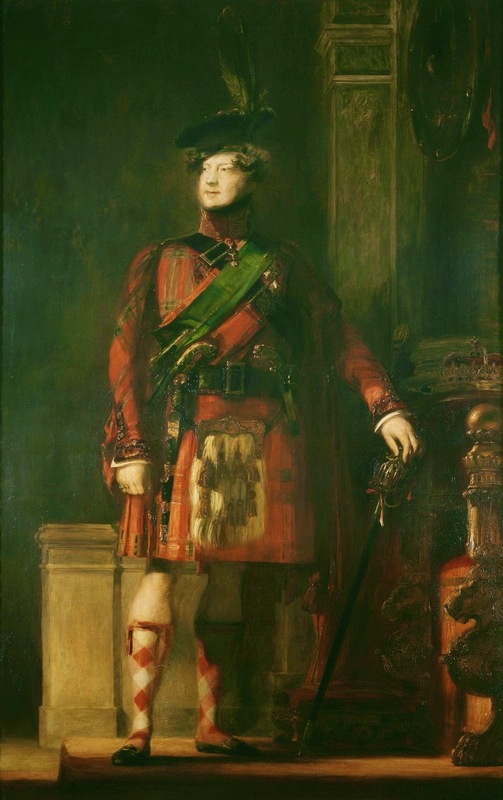 Here is the image of the future George III, the farmer king, in a stylistically archaic tartan uniform 70 odd years before his more sartorially recognized son, George IV, wore tartan so famously in 1822. George IV and Sir Walter Scott, the marshaling force behind the 1822 visit, have been criticized for their unbridled creativity and reinvention of costume. Maybe they did, but they were hardly new to the block. Jeffrey Hopper is an author, editor and the Manager of the Warner House, in Portsmouth, NH. I guess this uniform was exempted from the notorious Diskilting Act, which made it illegal to even possess any tartan. Fabulous, I hadn't actually seen that costume before. Great post! I hadn't seen that picture before and neither did I know about this company of archers. But I did know that the tartan worn by official loyalist groups (like the British Highland regiments) escaped the ban imposed after the Battle of Culloden. Dating and the considered use of historical anachronism in the past is a very interesting thing to consider indeed. Of course, we, supposedly well-informed 21rst century enthousiasts, are in danger of misinterpreting things like this... That why the context of costume finds is so important.